Is a mountain-biking getaway on your family's bucket list this summer? As more and more mountain resorts extend activities into the warm summer months, Liftopia.com, the largest online and mobile marketplace for lift tickets and mountain activities, has started offering lift tickets and packages for mountain biking at ski resorts across North America for the first time. As lift-served mountain biking is already a rapidly growing activity, Liftopia is working with many of the top mountain resorts, including Mountain Creek (NJ), Mammoth Mountain (CA), Schweitzer Mountain (ID), Grand Targhee (WY), Plattekill Mountain (NY), Greek Peak (NY), Oak Mountain (NY), Sunday River (ME), Waterville Valley (NH), Crystal Mountain (MI), and Beech Mountain Resort (NC). Lift-served biking is just as it sounds: you ride a chairlift to the top of the mountain and ride down trails back to the base. It is a similar experience to skiing in that it allows the whole family to enjoy time on the trails together. The only difference between this and regular mountain biking is the use of the chairlift to get you to the top of the mountain. Chairlifts are fitted with various hooks and racks that hold your bike. If you are just starting out, just ask the lift attendant for assistance. Just like skiing, the mountain is laid out with a trail rating system with slopes of varying difficulty. A green circle is the easiest and can likely be handled by kids. The blue square signals the intermediate trails and often incorporate features such as jumps. 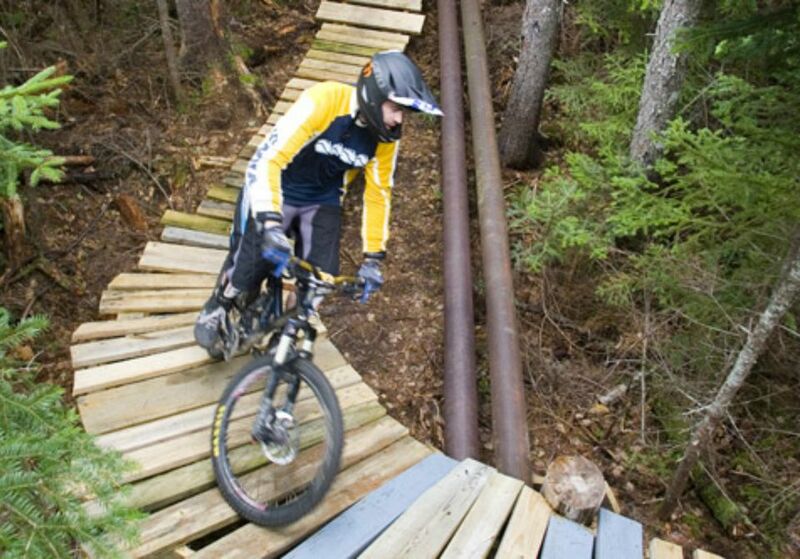 Black-diamond runs are for skilled downhill mountain bikers, who can weave their way down trails designed with twists, turns and natural features to make for a fun, fast and exhilarating ride down. At resorts that serve children, the minimum age is generally 5 or 6 years old. Some resorts may require children under 14 to be accompanied by an adult. You can bring or rent a mountain bike with front suspension. The trails at the resorts probably involve more descending than the trails you might ride at home, and the bikes available for rent at resorts are specially designed for this. If you are new to the sport, consider a lesson. Many resorts offer a beginner special, which will include bike and equipment rental, lift ticket, and a lesson. A beginner's package can be an affordable option for the cost-conscious newbie. In the winter, Liftopia is a marketplace for ski and snowboard lift tickets. Buying ski lift tickets online and in advance has always been a smart move, but unless you were investing in a season pass you needed to know your dates before making your purchase. Liftopia's triple-tiered pricing is different because it lets you get in on discounts even before you have inked in your ski trip plans. If you have nailed down definite dates, you can save significantly more.